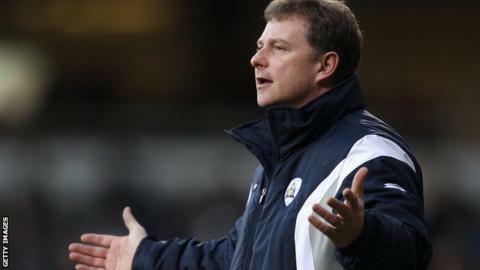 Coventry City have appointed former Rotherham United and Barnsley boss Mark Robins as their new manager. Manchester-born Robins, 42, has signed a three-year deal at the Sky Blues. Richard Shaw and Lee Carsley, the Sky Blues' caretaker management team, will now revert to their respective roles as assistant manager and first team coach. "This is a great opportunity. There is a lot to be done and I'll get straight to work with the players and backroom staff," said Robins. "Coventry is a club with great tradition and, although we find ourselves in League One, the squad that has been assembled is better than the results so far have shown. "I'm relishing the opportunity to turn things round and bring better times for the Sky Blues' supporters." Development director Steve Waggott added: "While we understand the supporters' anxiety over recent results, this was an appointment that simply couldn't be rushed. "In fact, considering the thoroughness of the process, we are pleased that within three weeks we have been able to whittle down 75 candidates to the one outstanding man for the job and that was Mark, who was categorically our first choice." Coventry, relegated from the Championship in April, currently sit second from bottom in League One, above Bury on goal difference - their lowest position in 53 years. Andy Thorn was sacked on 26 August, having started the season with three draws. But they have since suffered four straight defeats under Shaw, who was one of three candidates (along with Robins and Paul Ince) on the Sky Blues' final three-man shortlist. "Whoever comes in has got a big job on their hands," said Shaw after Tuesday night's 4-1 hammering at Shrewsbury. "If you can get it right here, nobody knows what this club might be capable of. "I don't know why the players are scared to go on the pitch and play because, training-wise, they're good. "Being only caretaker manager, you can't lay down what you want to lay down in terms of discipline. You need stability. And there's not a lot you can do, stood on the sidelines." Best known in his playing days as a young Manchester United striker, Robins began his managerial career at relegation-threatened Rotherham in March 2007, winning three of his first six games as caretaker boss after replacing Alan Knill. But then, after his appointment was confirmed, they failed to win any of their last five games and went down. After leading The Millers to ninth in League Two the following season, he had them on course for the play-offs a year later until financial problems forced them into administration and a 17-point penalty. After leaving for South Yorkshire neighbours Barnsley, Robins failed to have the same sort of success two divisions higher and has been out of management since quitting the Tykes at the end of the 2010-11 season. Since then, has had a consultancy role with the Premier League, working on their Player Performance Plan structure.